A Tonk's Tail... err, Tale...: National Love a Plant Day? Everyday should be Nip Day. Oh yeah, there definitely needs to be a catnip day! I agree....if there can be a National Chocolate Chip Day for humans (which there is), then there can be a National Catnip Day for us....yeah....! I love the way your catnip is a bed that you can go into and lie in. HEAVEN!! How fun that you get to go outside and show your nip plants some love and appreciation Allie. We can't go outside and the humans have yet to get a catio setup for us...not very thoughtful of them, huh? Awww Allie you are so beautiful in the nip plants. You know what I love - These pictures! You look beautiful! We admit to munching on the occasional blade of grass! I can see you really love that plant. You're sure showing that plant a lotta love, Allie! Us cats need to start a petition to get National Catnip Day officially recognized. 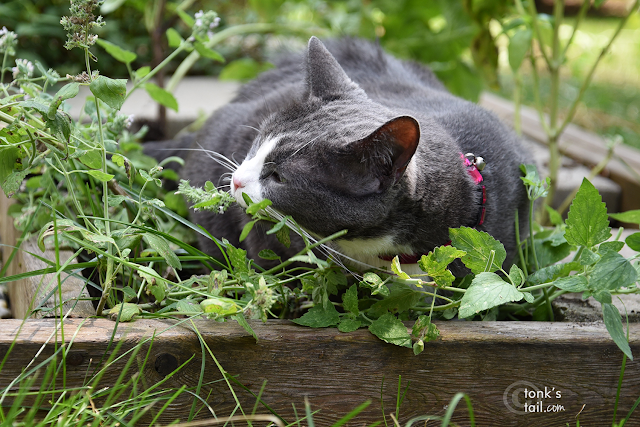 Oh, a nice romp in the catnip! My Eddie Bear and Felix used to do that. I'm not too interested in plants. I prefer chicken. My cat bro Bert feels the same way you do. He loves Nip!